RUR Architecture PC. 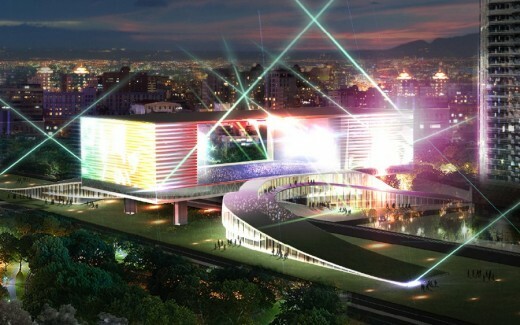 is proud to announce the groundbreaking of the Taipei Pop Music Center an urban complex dedicated to the celebration, production and performance of Taiwan’s pop music. 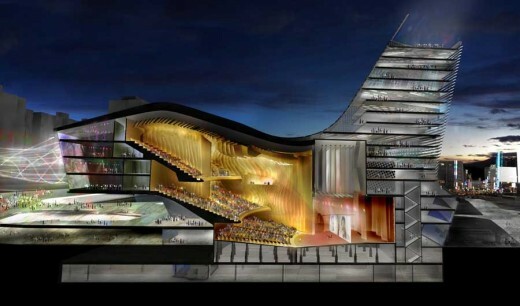 This iconic center features a variety of performance venues including three live houses, an outdoor performance space for 3000 and the Main Hall a faceted fan shaped building with a seating capacity of 5000. 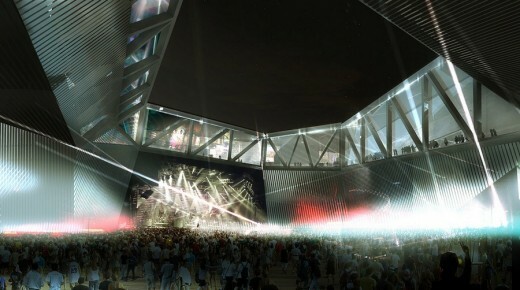 This veritable ‘city of pop music’ will allow for simultaneous performances ranging from large productions of internationally known artists to more intimate up-and-coming artist’s shows. 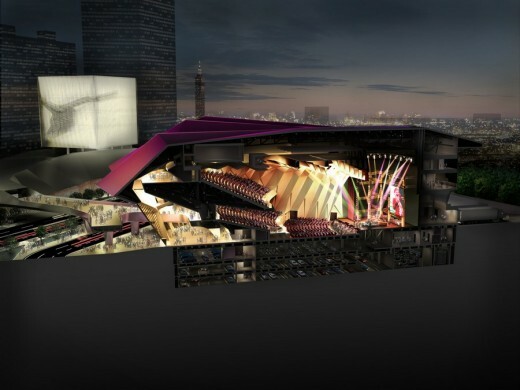 Up to date production facilities housed in the crystalline egg of the Industry Shell compliment those of the performance venues making this the preeminent facility in Taiwan dedicated to the music industry and its products. 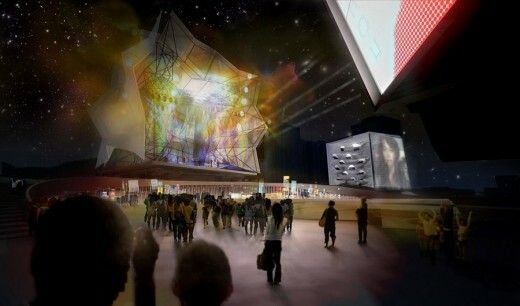 The History of Taiwan’s music industry is celebrated in the Cube – containing the Hall of Fame, a museum of pop, research and lecture facilities. The heart of the complex is a public forum in an urban park; an outdoor performance space ringed by shopping, restaurants and cafés. 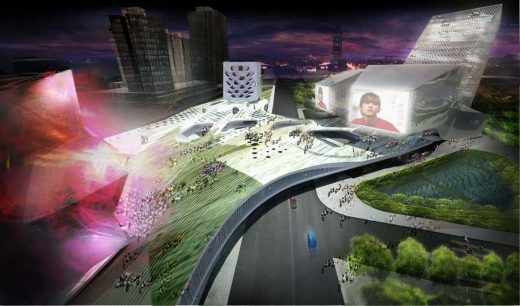 New York, NY – Reiser + Umemoto, RUR Architecture PC, is proud to announce that the groundbreaking of the Taipei Pop Music Center will take place Wednesday, June 19, 2013 at the center’s new site on the edge of Taipei, Taiwan. Envisioned as a coherent environment that challenges the limitations of traditional performances spaces, the innovative new center will consist of several mixed-use spaces woven together into a dynamic, multi-purpose venue that reflects and supports the evolving culture of pop. Taiwanese pop music, while enmeshed in its local roots, has also transcended them and operates on a global stage. Likewise, the TPMC simultaneously functions as an organic part of everyday Taipei life and as a global center for the music industry. The TMPC integrates theater with public space and commerce to become a cultural hub that will engage visitors independently of scheduled performances. While the scale and grain of the civic programs – retail, dining, offices, etc. – respect the vital fabric of Taipei street life, their architectural identity is unique and distinct. The groundwork of the site emerges from the ground but maintains its artificiality, allowing the center to be organizationally integrated into the city of Taipei while also remaining architecturally distinct. 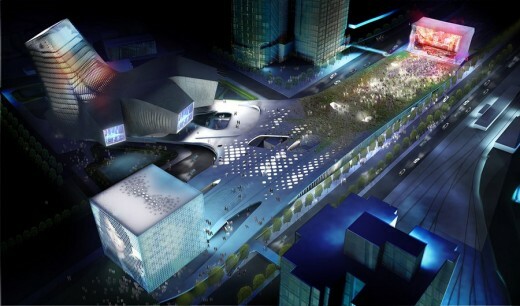 The new elevated public ground bridges two building sites presently divided by the Xinsheng Rd Corridor, and acts as a socle for three monumental elements: the Main Hall, Hall of Fame, and Industry Shell. 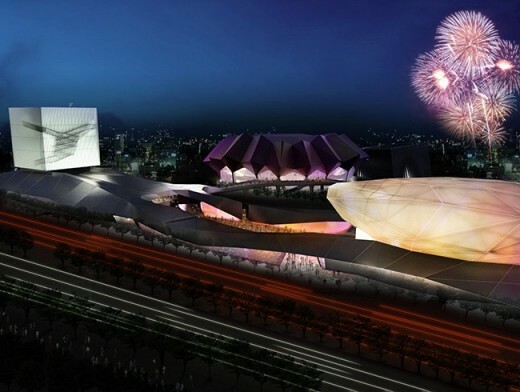 The iconic architectural programs symbolize the principal uses and attractions of the complex, making it a powerful representation of Taiwan’s pop music industry worldwide. 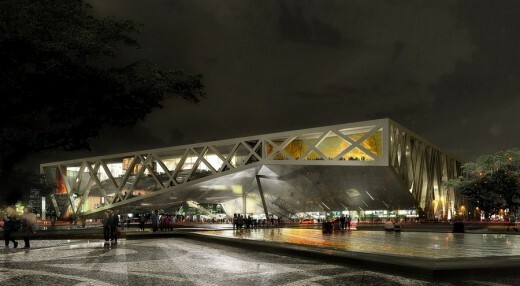 As the centerpiece of the TPMC, the Main Hall is a dynamic architectural form located on the northern site. With a seating capacity of 5,000, the interior auditorium is the jewel within the shell of the Main Hall. Visitors experience a series of unique spaces as they move from the faceted fan-shaped exterior of the building, to the soaring and inviting lobbies, and finally to the crystalline auditorium interior. The distinctive architectural form of the Main Hall is one bound to become an internationally recognizable symbol of Taiwan and Asian pop music. A pedestrian walkway bridges the Main Hall to the heart of the complex. On the southern site the bridge terminates in a grand staircase, opening to an outdoor performance courtyard with a standing capacity of 3,000. The staircase has a generous and gentle rise to house impromptu seating during concerts, while the Industry Shell at the other opposite end provides a spectacular cover for the outdoor stage. The courtyard is anchored to the east and west by three live houses, in addition to several dining and retail attractions. 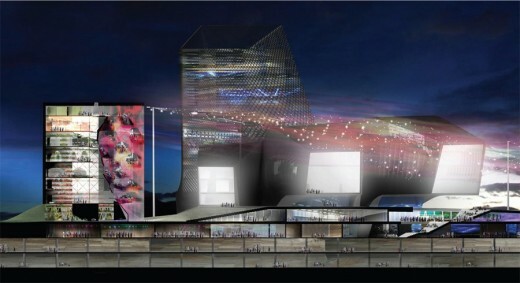 The crystalline egg of the Industry Shell houses up to date production facilities, which together with the performance spaces, make the TPMC the preeminent facility in Taiwan dedicated to the music industry. The Hall of Fame is housed within the cube, the TMPC’s most ideal architectural form and also the most autonomous object elevated from the ground. The ideal platonic geometry of the Hall of Fame cube is a testament to the highest achievements of pop culture. It is the place for the celebration and display of pop music and includes four floors of exhibition space, a café, administrative offices, research facilities, and a 300-seat lecture hall. Commissioned by the Public Works and Cultural Affairs Departments of the Taipei City Government, the TMPC is designed by Reiser + Umemoto, RUR Architecture PC in collaboration with the renowned local architect firm Fei and Cheng. Construction of the TPMC is set to begin this year with a scheduled completion date of 2015. RUR Architecture PC is an internationally recognized multidisciplinary architectural design firm that has built projects at a wide range of scales: from furniture design, to residential and commercial structures, up to the scale of landscape, urban design, and infrastructure. The firm provides a full scope of involvements with the relationship of architecture, structure and landscape and approaches each project as the continuation of an ongoing inquiry, delving into relationships among architecture, territory and systems of distribution. By working on projects of varying scales the firm has developed flexible strategies and techniques that integrate domains that historically have been kept apart. Jesse Reiser (USA) and Nanako Umemoto (Japan), who have been practicing together since 1986, created RUR Architecture PC to be an incubator of innovative architecture and design culture. Jesse Reiser is a Professor of Architecture at Princeton University. Nanako Umemoto is currently a Visiting Professor at the Southern California Institute of Architecture, Los Angeles, CA and the Columbia University GSAPP, New York, NY.